I added a chapter to our 2003 "Boss Week" Special this time around so that I could feature ANOTHER great Springsteen "Tribute" track. This one has become quite a Forgotten Hits Favorite over the past several years. It's done by a band called Big Daddy ... and we've recounted the premise of THEIR existence several times in the past. "While on a USO tour of Southeast Asia in 1959, Big Daddy was captured by Communist forces and held captive until the mid-'80's, at which time they were rescued by C.I.A. forces and subsequently returned to the United States. While being held at Camp David for de-briefing, they were given sheet music of contemporary hit songs so that they could rebuild their repertoire and get back to the only work they knew ... making music. Of course, not having heard the evolution of rock music during the quarter century they spent imprisoned in the jungles of Laos, they arranged and performed these songs the only way they knew how ... in the classic styles of the 1950's. Rhino Records got wind of the recordings made by Big Daddy at Camp David recording studio and immediately signed them and released the album ... hey, it could've happened!!!" NOTE: I found out later that in 1991, screenwriter Ira Hefler wrote a script based on the whole captivity story ... and "Big Daddy ... Stranded In The Jungle" ran for eight weeks at The Groundlings Theatre in West Hollywood. One of their first releases was Bruce Springsteen's "Dancing In The Dark". While the single never charted here in The States, it DID reach The Top 20 in Great Britain, where Big Daddy was touring at the time. Sit back and enjoy the Big Daddy version of Dancing In The Dark ... and thanks again for sticking with us all week long for our Tribute to Bruce Springsteen!!! In 1983, when the movie "Eddie And The Cruisers" was first released in theaters, it got very little attention. In fact, the first singles released from the soundtrack, "On The Dark Side" and "Tender Years", both bombed, peaking at #64 and #75 respectively. However, when the movie began running on cable (at up to six or seven times a week), it found a whole new audience. The soundtrack album started selling like crazy, eventually peaking at #9 and going triple-platinum! The truth is, quite a few folks out there thought the story was true. I had a mail-order record business at the time, and received SEVERAL orders for the original "Eddie and the Cruisers" album. When I shipped the soundtrack, people mailed it back saying that they already had THAT album ... they wanted the original LP shown in the movie! I had a heck of a time convincing these customers that the movie was FICTION ... that the only album that existed WAS the soundtrack! If I had a nickel for every angry, disillusioned customer whose bubble I burst with this reality shock, I'd probably have an extra forty-five cents in my pocket right now! John Cafferty and the Beaver Brown Band managed a couple of other hits under their own name: "Tough All Over" went to #20 and "C-I-T-Y" peaked at #18, both in 1985. A horrible movie sequel ("Eddie Lives!") also featured the band's music and both a live LP as well as an album of movie soundtrack left-overs were also released under the Eddie and the Cruisers pseudonym. 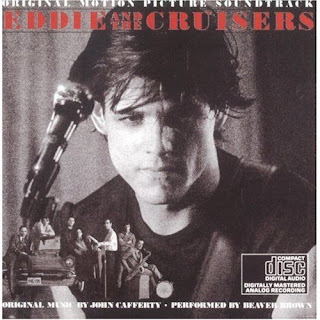 "Tender Years" is a personal favorite of mine from the original "Eddie and the Cruisers" film. The movie shows the song take shape as they first work out the original arrangement and then later appears in its fully realized form in a concert sequence. (It's also sung again later in the film by Eddie's girlfriend after their sax player Wendell dies and Eddie is too broken up emotionally to perform on stage that night.) It just may be the prettiest ballad ever that Bruce Springsteen didn't write! After his first U.S. hit single Speak To The Sky went to #14 in 1972, Australian-born Rick Springfield had to wait nearly ten years to place another hit in the American Top 20. But when he finally did, it went all the way to #1. Jessie's Girl topped the charts in late spring / early summer of 1981 and started a string of comeback hits that included The Top 20 Hits I've Done Everything For You (#8, 1981); Love Is Alright Tonight (#20, 1982); Don't Talk To Strangers (#2, 1982); What Kind Fool Am I (#19, 1982); Affair Of The Heart (#9, 1983); Human Touch (#18, 1983); Love Somebody (#3, 1984) and Bop 'Til You Drop (#20, 1984). During the in-between years, he carved out quite a teen-idol career for himself playing Dr. Noah Drake on the daytime soap opera General Hospital. And, in 1985 (as his pop chart career was just starting to slow down), Mercury Records released the very cleverly written track "Bruce" as a single. 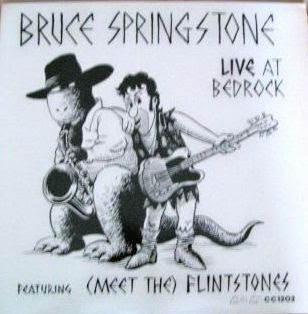 Bruce was first recorded back in 1978 at a time when Springfield couldn't buy a hit. It told (in a humorous way) of his frustrations of constantly being mistaken for Bruce Springsteen who, at the time, was in the midst of launching an ENORMOUS career. 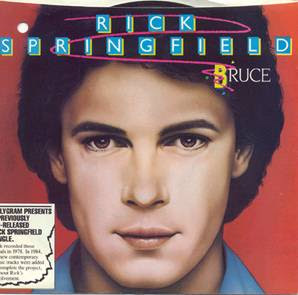 Springfield wrote the track with tongue planted firmly in cheek, yet it was never officially released at the time ... in fact, the picture sleeve came with a disclaimer explaining that, although the original 1978 vocals were used, "all new contemporary music tracks" were recorded "without Rick's involvement." Imagine Springfield's surprise, then, when the single went all the way to #26! It's all part of our "Tribute to Bruce Springsteen Week" here in Forgotten Hits! Back in 1990, the NME Musical Express released an interesting special tribute to Elvis Presley called "The Last Temptation Of Elvis", a two-CD set of Elvis cover songs, featuring songs from his movies redone in a contemporary style by artists as diverse as Paul McCartney (who did It's Now Or Never, which isn't actually from an Elvis movie ... but seriously, who is gonna tell Paul McCartney, "Sorry, you can't do that one"!!!) to Hall And Oates (the classic Can't Help Falling In Love) to Aaron Neville (covering Young And Beautiful) to Robert Plant (Let's Have A Party) to Dion DiMucci (Mean Woman Blues) to The Blow Monkeys (Follow That Dream) to The Jeff Healy Band (Down In The Alley) to The Cramps (Jailhouse Rock) to The Primitives (Baby, I Don't Care) to The Jesus And Mary Chain (Guitar Man). In 1967, Elvis scored a #38 hit with Big Boss Man which, for the purpose of THIS article, we're going to INSIST must have been written with Bruce Springsteen in mind. (Even though Springsteen was only 18 at the time of its release, we figure that, being "The King Of Rock And Roll," Elvis must have known that somewhere down the line, SOMEBODY named "THE BOSS" would also eventually be a HUGE influence in music!) Besides, it's BOSS WEEK and this gives us a chance to do an excellent Springsteen / Elvis Two-fer!!! By the way, if that guitar intro sounds a little bit like Elvis' other hit Guitar Man, it's no coincidence ... both tracks were recorded at the same recording session and that's country picker Jerry Reed playing guitar on both tracks. (Reed wrote Guitar Man and, at Elvis' insistence, played guitar on the session.) Reed would go on to have his own pop chart success a couple of years later when Amos Moses and When You're Hot, You're Hot followed each other into The National Top Ten. UPDATE: We lost Jerry Reed last year. Bruce Springsteen was a HUGE Elvis fan ... I think even HE'D enjoy our little tribute here today!!! With the WORLD SERIES upon us (remember, this piece FIRST ran in October of 2003!!! ), this seemed like an even more timely time to feature today's track!!! Since we gave Bruce Springsteen a fair amount of ribbing last week in Forgotten Hits, I felt that it might be appropriate to rerun our 2003 Series, "BOSS WEEK", this week as a bit of a tribute. I've always enjoyed more of The Boss' "commercial" work than a lot of those favored by his die-hard fans. For me, Springsteen never sounded better than he did on "Hungry Heart" or the tracks off his "Born In The U.S.A." album ... at the time, a number of the "die hards" had felt that Springsteen had "sold out" at that point ... especially when they saw his "Dancing In The Dark" video with a then-unknown Courtney Cox!!! Anyway, here's our original series EXACTLY as it ran way back when ... with a few "updates" here and there where appropriate! Actually, it's our mini-tribute to Bruce Springstten. This week, we're going to feature some strange little pieces of music that owe their very existence to the phenomenon known as "THE BOSS." 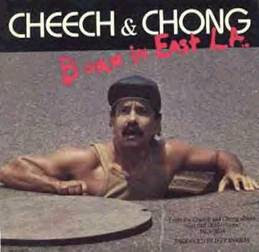 It all kicks off today with Cheech and Chong who, in 1985 just missed The Top 40 when their novelty / parody hit Born In East L.A. peaked at #48 on the Billboard Chart. The Boss had just scored an incredible seven straight Top Ten Hits with the singles released from his Multi-Platinum "Born In The U.S.A." album. (Dancing In The Dark, #1; Cover Me, #7; the title track, Born In The U.S.A., #8; I'm On Fire, #6; Glory Days, #5; I'm Goin' Down, #9; and My Hometown, #6.) Think about that for a second: Seven Straight Top Ten Hits from ONE album!!! Heck, I've got "Greatest Hits" CDs in my collection that don't have THAT many hits on them!!! Fact is, Springsteen was hotter than ever. We last featured Cheech And Chong as part of our Chicagoland #1 series, when we spotlighted Earache, My Eye, which topped the charts here in Chi-Town in 1974. A couple of other Cheech and Chong hit singles were also successful parodies ... Basketball Jones (#13, 1973, but a #2 hit here in Chicago) came from the soul hit Love Jones by The Brighter Side Of Darkness (which also made The Pop Top Ten in Cash Box) and Bloat On, which was a GREAT take-off on The Floaters' #1 Soul Hit Float On, also a major Pop Hit. (That one peaked at #2)! Born In East L.A. also features a mini-tribute to Randy Newman's "I Love L.A." thrown in for good measure ... it's a fun way to kick off this new little series. UP IN SMOKE: If plans for a brand-new Cheech And Chong movie haven't gone completely Up In Smoke, they've certainly been put on hold for a while ... 65 year old Tommy Chong is currently serving jail time for selling drug paraphernalia on the Internet!!! UPDATE: Chong was later released and turned the whole experience into a Reality Show for television!!! (Is there ANYTHING that hasn't been turned into a reality show for television???) Meanwhile, former partner Cheech Marin has had a pretty successful acting career, appearing in big screen movies with Kevin Costner and as a TV regular on Don Johnson's "Nash Bridges". He is currently a semi-regular on "Lost", portraying Oceanic Six Survivor Hugo Reyes (Hurley)'s father. Chong did some TV time, too, appearing on That '70's Show. The duo recently reunited for a comedy tour ... and are on the road as you read this!